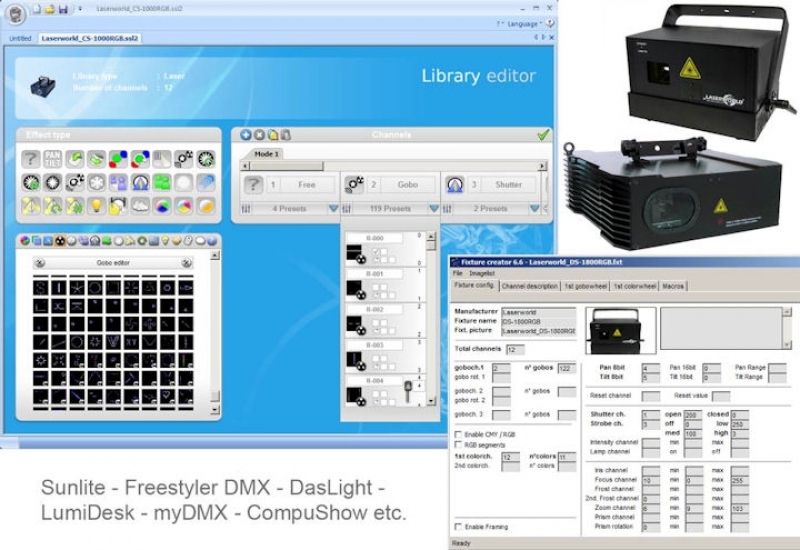 When it comes to fixture profiles and presets for conventional lighting fixtures like moving heads or PAR cans, most are included in most DMX software programs’ libraries. However, when it comes to fixture presets for lasers, this is an entirely different situation. The majority of software programs just come with a generic library, one that will basically allow the on-off feature and some sound to light and automatic modes of lasers to be enabled. There is much more that can be done with lasers through DMX control, but it is difficult to create such fixture presets, as the major difference between lasers and e.g. moving lights, is that the variety of implemented “gobos” is huge. Lasers are extremely different from the generic preset systems that come with popular software products. To combat this, it is necessary to generate new pictures for each “gobo”, or as they are called in the context of lasers, “frames”. This can be time consuming and require hours of programming, especially as some Laserworld lasers have over 200 different frames built-in, some of them already animated.The picture icons of these frames are essential to allow for proper “gobo” selection in the software, whether it be for live shows or for programming. And so, Laserworld decided to publish several fixture presets and fixture profiles for some of their show laser light systems, especially for the extremely popular Club Series units and the Diode Series lasers. All fixture preset packs can be downloaded from the Laserworld download space. They include the fixture preset and profile, as well as the corresponding pattern icons, and are available for a variety of different DMX software program libraries. A short readme.txt with instructions on how to install the presets and the frame icons is included too.